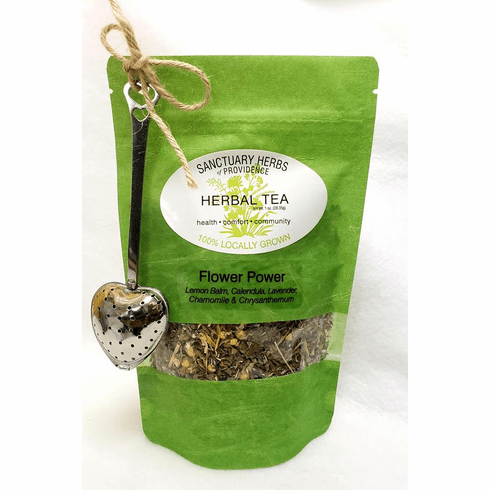 Sanctuary Herbs & Teas brings to you an extraordinary line of herbs whose essence enhances health, comfort and peace. Everything is grown and produced locally -teas and herbs are sourced in partnership with Rhode Island's refugee and immigrant farmers, with the goal of expanding small, local farm viability. Each bag of loose tea includes our exclusive heart-shaped tea steeper. Flower Power: Lemon Balm, Calendula, Lavender, Chamomile, Chrysanthemum. Cloud 9: Spearmint, Tulsi (Holy Basil), Lavender. Glitter: Lemon Verbena, Lemongrass, Ginger, Peppermint. Soothing Citrus: Lemon Basil & Chamomile.